Is Flying Once Per Week Enough? You live in New York City, and you been bitten by the flying bug. Your new goal is to earn a private pilot certificate. In 2017 according to the U.S. Civil Airmen Statistics, there were 149,121 active Student Pilots and 162,455 active private pilots. Those numbers also include foreign pilots training in the US. Note: Do you know what the process to becoming a private pilot is? If not, visit our blog about Training for a Private Pilot Licenses. Flight Training is like going to the gym. Buying a gym membership is the easy part. you will need a personal trainer. The gym needs to be conveniently located to meet my demanding schedule and most importantly, you need to stay focused and motivated. Let’s face it, we live in a world full of distractions, and there are not enough hours in the day. Airports where flight training is available are not around the corner. To set you self-up for success, you need to plan to fly 2-3 times per week and pass the written test requirement early on your training. My question to you is this: Can you afford the time to fly 2-3 times per week? Most people answer NO. Most people can only fly once per week. We have 365 days in a year=52 weeks in a year= maximum of 52 flight lessons per year. But wait, are you available every weekend of the year to fly? Holidays, birthdays, anniversaries, illness, work, and bad weather will all get in the way. Realistically, you may fly about 30-40 flight lessons in a good year. 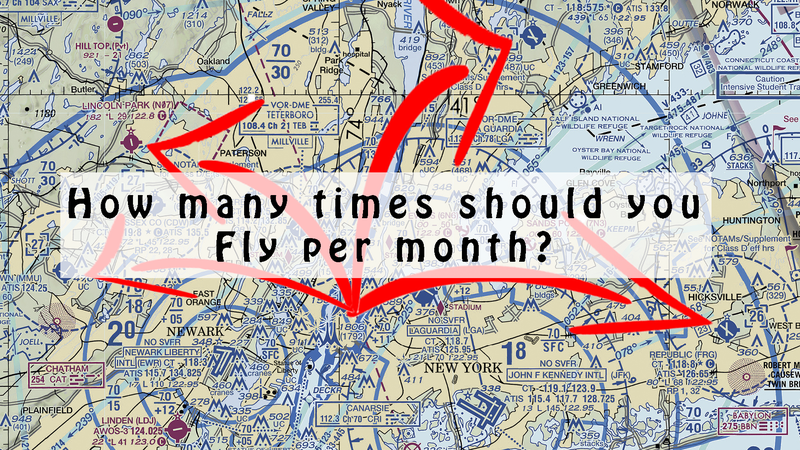 Another factor that has a negative impact on your flight training is the length of your commute from NYC to any of the local General Aviation Airports? Driving during off-peak hours to the nearest general aviation airport takes approximately 45mins and up to 2 hours during peak hours. Public transportation, at least 1:15mins, plus the Uber from train or bus stop to the airport. When you get to the airplane, you are just beginning. You need to Pre-Flight the aircraft and get a weather brief (about 30mins – 1hours). Then you will normally brief the flight with your instructor (15-30 minutes). Next, fly for 1:30-2hours, secure the airplane (15minutes), and finally, debrief the flight (15-30mins). All this means, that for a 2-hour flight almost a quarter of the day is spent and much of this time is unproductive. If you fly once per week, you will probably be close to the 60-80 hour national standard Private Pilot Certification, according to AOPA., and this is well above the 40 hour minimum the FAA requires for a Private Pilot Certificate. If you fly 2-3 times per week, you are much more likely to finish at or around the minimum 40 hours required by the FAR’s. Simtech Aviation is conveniently located in Midtown Manhattan. Our flight simulator allows you to remain active in your flight training without ever having to leave NYC. To learn more about our Aviation Training Devices Click Here to learn more. If you plan to fly once a week, you can complement your flight with a session in our simulator. Take advantage of our experienced flight instructors (all current airline pilots) and practice real world skills on our simulator. Simtech Aviation helps you maximize your time and efficiency. Honing your skills in our simulator before you fly and enabling you to achieve pilot certification in the minimum amount of time. Let Simtech Aviation help you achieve your aviation dreams right here in NYC.